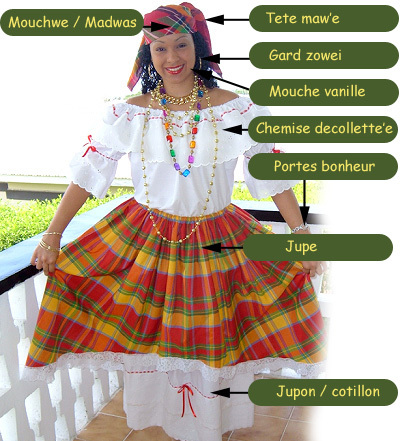 The Wob Dwiyet dress (creole, from the French ‘robe douiette’) is part of Dominica’s national costume,and is a national symbol of Dominica. It gives rise to the annual Miss Wob Dwiyet competition which is part of our Independence celebrations . The competition highlights both our national costume and the talents of our young people. Heritage Day – Late October, Held in a different village every year, this day celebrates our cultural heritage. Jounen Kweyol (Creole Day) – Late October. On this day islandwide people speak creole and wear the national dress. Miss and Madam Wob Dwiyet shows – Arawak House of Culture, Roseau. These two shows highlight the talents of young and old. Market Day With A Difference – Roseau Market, Saturday prior to Independence. Colourful at the best of times, the Market bursts into both colour and music on this day.